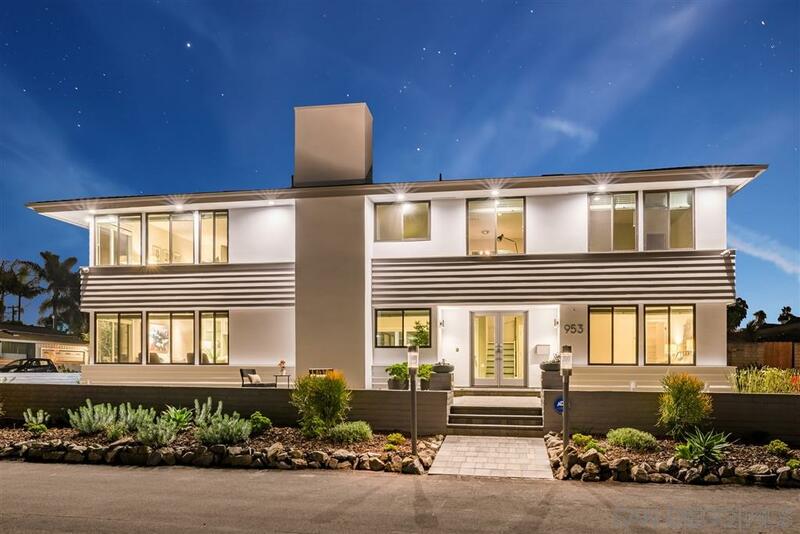 Stunning contemporary home designed by noted architect perched over Mission Valley w/ 180-degree coast to mountain views in secluded enclave of University Heights. Corner lot w/ lush, drought tolerant landscaping on drip irrigation. Modern open floor plan w/ sliding glass doors in kitchen & living area that open to private 900sf patio for your indoor-outdoor entertaining. Home meticulously remodeled w/ extreme attention to detail. Views from every bedroom & main living area! Don't let this one slip away!, Designed by architect Ronald K. Davis, known for his modernist architecture. This home has been tastefully remodeled with upgraded kitchen, Bosch stove, SS appliances, sleek contemporary cabinets, pullout shelves, pullout baskets, wet bar and wine glass racks. New porcelain tile floor in kitchen, laundry room, and powder room. New hardwood flooring at stairs and bonus media room/office area. Fresh paint interior/exterior. New paver driveway, entry and front patio overlooking Mission Valley. New bathroom sinks, cabinets, and European shower heads. Surround sound and central air throughout home. New city approved concrete garage floor. Huge storage in attic above garage. Additional storage room off garage w/AC w/ great potential for temperature controlled wine cellar. Organic vegetable and herb garden w/ avocado, citrus and fruit trees. Home equipped with upgraded ADT security system and cameras. Seller has rough architectural renderings for an addition or to build a granny flat/ADU for additional income. Home sits across from expansive open space park, close proximity to booming Park Blvd for local dining, shopping, cafes, restaurants, bars, and family friendly Trolley Barn Park. Easy access to freeways, downtown, and airport. This home has it all!